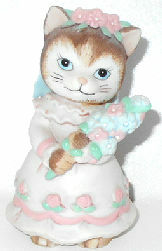 Kitty Cucumber is wearing a long dress, a veil and is holding a bouquet of flowers. She is 3" high x 1 7/8" wide. Design copyright 1994 BC. Previously owned but in good condition.